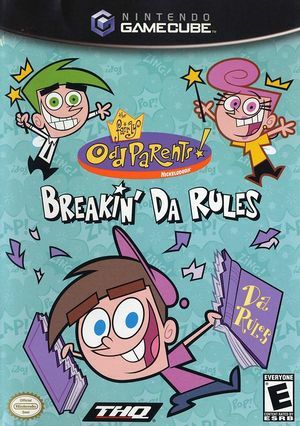 The Fairly OddParents: Breakin' Da Rules is based on the famous Nickelodeon cartoon, The Fairly OddParents. In the game, the "Da Rules" book (the ultimate guide to having Fairy Godparents) has disappeared, and Cosmo and Wanda are left without their magical powers. Throughout this platform adventure, one plays as Timmy as he enters the comic book world, battles evil viruses, avoids boy-eating plants, and finally comes to the rescue of his Fairy Godparents. Set off on an amazing adventure to recover all the pages from "Da Rules" book and restore his Fairy Godparents' powers. The widescreen hack has misaligned items and effects which can be fixed with a gecko code. The graph below charts the compatibility with The Fairly OddParents: Breakin' Da Rules since Dolphin's 2.0 release, listing revisions only where a compatibility change occurred. This page was last edited on 18 March 2019, at 08:26.